The days are getting longer but it's still really cold (-10°C right now). The wind has been particularly nasty on occasion. 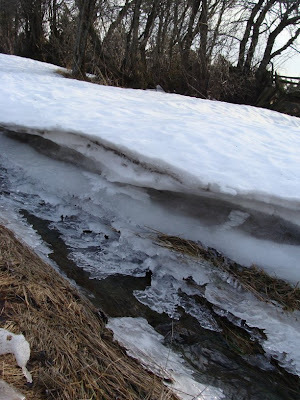 This photo is an attempt to capture the thickness of the layers of snow and ice that have built up next to the stream. Precious few signs of spring out there. 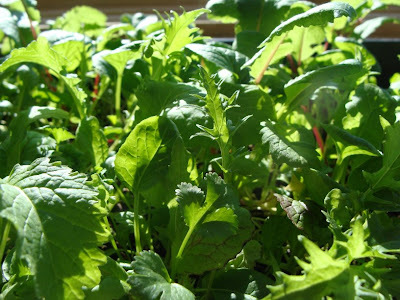 Inside I have got some signs of new life with the lettuce mix I sowed in January. They've been growing away well on the living room window sill. I've been putting them out on the veranda on the few days where the temperature has been above freezing. I thought I'd killed them the other day as they had become rather wilted by the afternoon, but was relieved to see this morning that they've bounced back to health again. Some of these will be big enough to eat, soon. 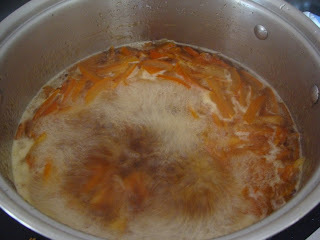 After making marmalade for the first time last year, I was looking forward to doing so again. I keep seeing other bloggers mention theirs and have been looking out for Seville oranges every time I go shopping. Until this weekend: nothing. I was beginning to get twitchy and irritable about the lack of marmalade-fodder. We shopped at the A&P in Belleville yesterday and they had about 12 very sad Seville oranges. I asked if they had any more and was informed that "That's all we've got and there won't be any more". I finished my shop (a very minimal one because by now I was feeling super-grumpy) and we trekked down to the Dewe's store and, joy of joys, they had a large display of lovely-looking Seville oranges. I bought a couple of kilos and left, very happy. americans eat one meal out of five in a car. the western industrialised food system is fast ruining our planet, our social and economic relations, our bodies, our understanding and appreciation of these things, and ultimately our happiness. 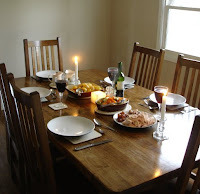 there are plenty of things wrong with the world, and cooking lovely food isn’t going to lead to world peace, but life for many could be a bit better if more people cared where their food came from and how it was made, had some basic cooking skills so they needn’t rely on processed food, and took time to eat together. plus, cooking is a creative outlet and a hopefully healthy addiction. food can be so delicious and also so bad. it’s more fun to eat the delicious stuff. This is someone I feel I can trust! The marmalade recipe is the one her mother uses, based on one by Katie Stewart in The Times Cookery Book. Phew, that feels like a long and convoluted provenance (here's the recipe: it's a PDF file). I had about 4½ pounds of fruit, so had to multiply everything in the recipe by 1½. 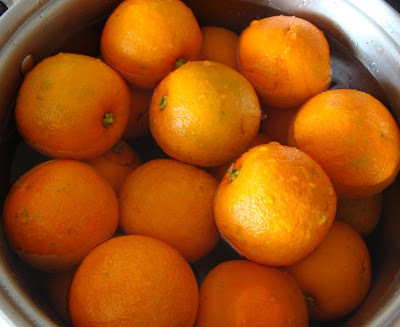 The simmering-the-fruit phase takes an hour, then the oranges are cut open and the pulp and pips put into one bowl and the peel into another. Here is my first attempt at a video cookery demo (so be gentle in your criticisms please - I know it isn't very enthralling - and I think I sound horribly like Delia Smith!). This is to demonstrate step three in the recipe above - the way that the oranges look after they've been simmered for an hour. While it's boiling the marmalade fills the house with a wonderful syrupy citrus smell. The finished product looks fine - just as dark and chunky as last year's, but with a shorter cooking time, which is what I wanted. It made eight one-pound jars, which is about four fewer than the recipe suggests I should have got. My other Valentine's Day present was a fine trailer-load of cedar planks and posts, which were destined to become the raised beds in the greenhouse. We had thought we'd be able to use pressure-treated timber, but I remembered some question about arsenic being used in that process (rendering it not safe for use around food crops) and Mike looked it up to check. Well, the good news was that arsenic hasn't been used in the pressure-treating process since 2003, but the bad news was that if you want to grow food that will be certified organic, it might not be acceptable. Using cedar planks was the other option. The wood should last for 20 years - but was twice the cost of the pressure-treated alternative. 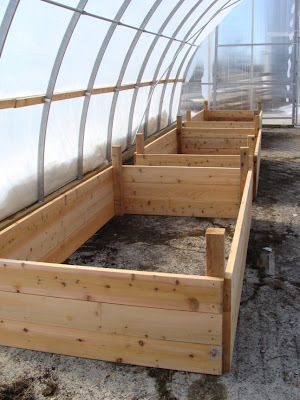 So I really do need to sell some of the food we'll be growing in these beds in order to justify the expenditure. Which means jumping through the organically-certified hoops at some point. Oh joy. It's a bit slick up by the barn, where all that water froze overnight. The dog was not impressed. 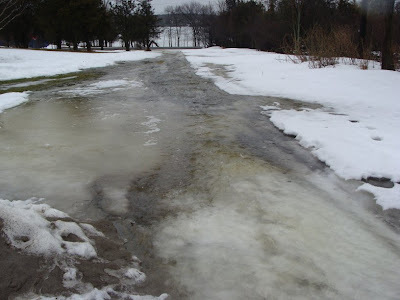 A few days of above-zero temperatures and over an inch of rain have left us swamped with far too much water. Yesterday began rather attractively with layers of mist forming above the snow. I stopped on my way to work in Deseronto to take this picture of the Bay of Quinte from Georges Road. 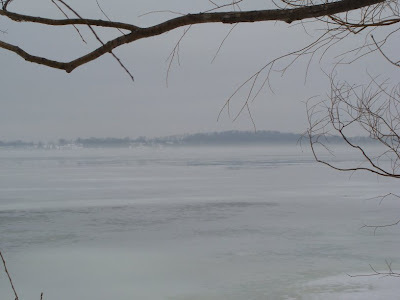 The mist was forming above the ice on the bay as the snow began to melt. Last night was just plain foggy. We drove back from a meal in Picton through some of the thickest fog I've ever seen. Where there were road markings, it wasn't too bad because you could line up with the white and yellow lines, but on the minor roads it was scary because the edges weren't so obvious. It was particularly frightening coming along Lakeside Drive, as we were all too aware of the proximity of the lake in question! 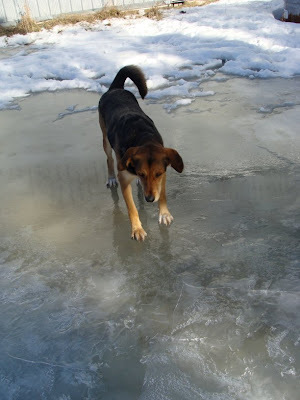 The worst part is that the weather is due to turn cold again for the next week, which will turn all of this water into ice and make it even more difficult to walk! Enough grumbling. 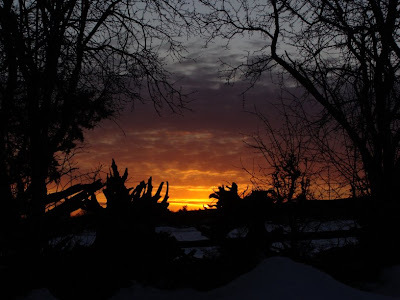 Here's a pretty sunset from the other night to change the subject. 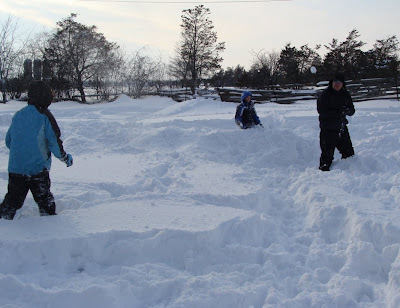 We've had so much snow over the past week. 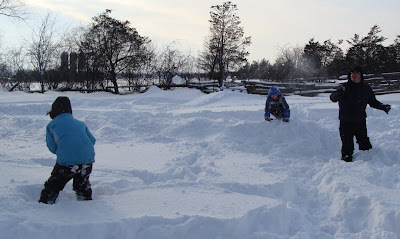 The kids are thoroughly enjoying it: making forts, snow-people and burrows and getting completely caked in it. The demand for hot chocolate is high. 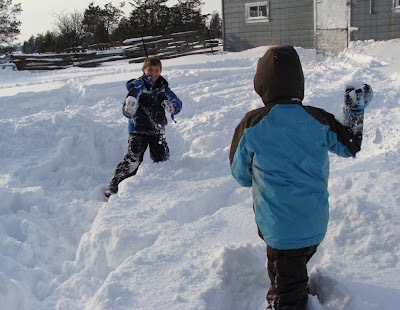 After this family snow battle on Friday, child #2 declared it to have been the best fun he'd ever had (except for our trip to the water park in Montreal last year). That made me smile - you can spend a fortune on electronic gadgets of various kinds, but in a child's mind, it's the time you spend doing fun things together as a family that are the best.